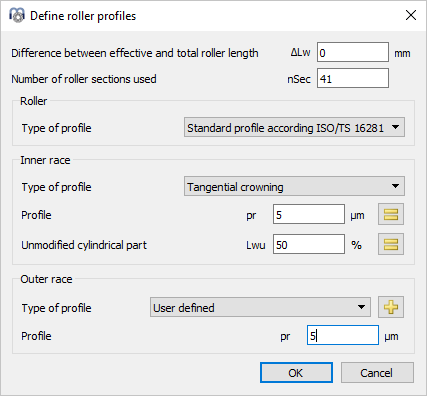 Profiles can be defined for inner race, outer race and roller. As general inputs, the difference between effective and total roller length can be defined. As it increases the stiffness of the roller, it has an influence on the calculation. The number of sections for the calculation has to be larger 30 and has to be an odd number. The calculation accuracy and the calculation time increase with a larger number of sections. This is using the defaults of the standard, which is logarithmic profile of the roller and no profile on the races. For the roller, a sizing button provides the default relief according ISO/TS 16281. The default relief of 0.00035*Dw for short cylindrical roller bearings corresponds to a contact stress of 3000MPa. The maximum relief is not infinity at the edge of the roller like in the logarithmic profile according ISO/TS 16281 but limited to the maximum value of pr. Using p =3000MPa and pr=Infinity, the results are the same as for the logarithmic profile according ISO/TS 16281 above. 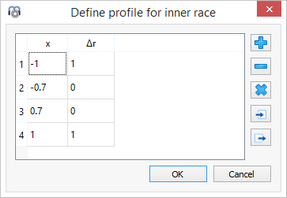 The material data for this profile is always taken from the contact roller/inner race. A circular arc tangential to the cylinder is used to generate the profile. The amount of relief and a percentage of unmodified cylinder length can be defined. A circular arc with center positioned axially on the center of the roller is used to generate the profile. The amount of relief and a percentage of unmodified cylinder length and a transition radius can be defined. The profile can be read from a file. The data has to be specified with two values on each line, an axial position and the profile relief. The axial position is scaled with the roller length and the relief is scaled with the input for the profile relief. So a range from -1 to +1 can be used for the axial position and 0 to 1 for the relief. The unsymmetrical profile is used from left to right for most bearings. For taper roller bearings and axial spherical roller bearings, the profiles is used from left to right if direction of contact angle is left. For contact angle to the right, the profile is mirrored. So mounting conditions do not influence the profile. 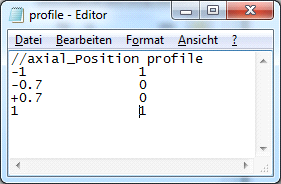 Instead of defining a file name, the points for the profile can be defined in a table. Again as above, use a range of -1 to +1 for the axial position and a value between 0 and 1 for the profile relief. The table in the diagram on the right shows the same data as the file above. 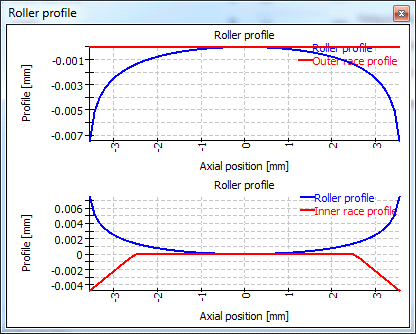 The profiles can be shown in the graphics for roller profile.